Along with the manufacture of wire rope slings and assemblies, LGS offer Architectural Rigging as a rather unexpected product. We have many years of experience in the swaging of Stainless Steel Wire rope and components. The pictures tend to say it all but we hope that, if you do have a requirement, you’ll contact us for free advice. Threaded studs, Eye Terminals, Fork ends, Rigging Screws and Ball Ends, are just some of the fittings we can swage – the range and choice are almost endless. 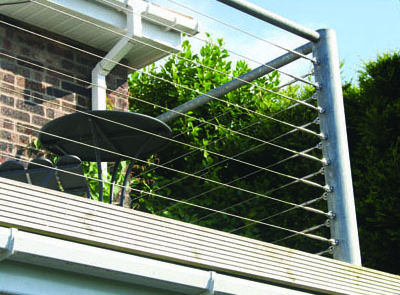 While on the subject of Wire services, LGS are also approved installers of Roof Safety Line systems.